Many years have passed since I took Driver's Ed...and I don't think I paid much attention anyway. There is, however, one specific thing that my Driver's Ed teacher told me that I will NEVER forget. "Kris, if you don't stay focused on the road, we are going to end up in the ditch!!!!!!!!" See, my mind is prone to wander and all sorts of things catch my eye as I am driving. 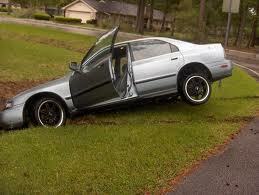 What my Driver's Ed teacher soon found out was that my car went in whatever direction I was looking. So, if I saw an interesting tree on the side of the road.....we were headed for the ditch. I recently learned a valuable truth that reminded me of my Driver's Ed teacher and the ditch incident. That truth has proven as valuable to my spiritual walk as anything I have learned thus far. I'll tell you all about it and, should you choose to apply this to every trial and trouble you go through, it will save you restless nights of worry, the anxiety associated with plotting revenge, and the terrible feelings of bitterness, anger, resentment, fear, and unforgiveness. "If you don't stay focused on Christ, you are headed for the ditch!" Perhaps you have heard this truth presented another way.... "In the storms of life, keep your eyes on Christ and you won't sink into the crashing waves." Take a moment and read Matthew 14:22-33. Now, look closely at verses 28-31. We all will face terrible storms in this life. We will have troubles in this world. Jesus himself said so. (John 16:33) Everything we need to know to survive a stormy season of life is contained in the story of Peter walking on the water. 1. The best thing to do is to STAY focused on Jesus, NOT the storm. Peter did not sink until he shifted his focus from Jesus onto the wind. When he focused on the wind (the storm, the trial, the troubles) he became afraid and began to sink. 2. If you miss step one and find yourself sinking in the waves (of depression, doubt, bitterness, unforgiveness, anger, revenge, judgment, fear, panic, etc.) then CALL OUT to Jesus! Once Peter realized he was sinking, he called out to Jesus and Jesus saved him. Sounds easy enough. Sadly, it is not so easy, at least not for me. I want to take care of things myself. I worry about the "what ifs". Staying focused on Jesus is harder than it sounds when you are in the middle of the raging seas of divorce or cancer, or infertility, or death, or betrayal, etc. You must make a conscious effort to CHOOSE to stay focused on Christ Jesus, and when you lose your focus and start to sink, call out to you Jesus, the one who saves! To be victorious takes effort. Thanks be to God that Jesus finishes John 16:33 by telling us that HE has already overcome the world. We need not fear. We serve a MIGHTY God! I have to ask myself on occasion if I truly believe that God is in control and remind myself that I can't select the things that He is in control of. He is either Almighty or He is not. I have to remind myself that God knows the big picture and the WHOLE story and He has a perfect plan that I may or may not understand. Finally, I have learned that when I give in to my flesh and fight my own battles, I most times make things worse and almost never experience the joy of seeing what God did through my storm. Are you headed for the ditch? Have you lost your focus? Have you taken your eyes off of the One who Saves you and focused instead on the waves crashing around you? What things consistently steal your focus? Do you, beloved child of the Most High God, truly believe that God is in control? Which best fits your attitude about victorious living, "Victory in Jesus" or "Victory through my own strength and power"? You are Almighty. You are All Powerful. I do trust that you have got my life held in your hand. I am so sorry that I lose sight of your face and focus instead on my troubles and on those who would cause me pain. Help me Father to always strive to be near to You above all else. Forgive me for wanting to do things my way and for acting as judge and jury in situations I don't fully understand. I trust you Father and I do believe that you have everything under control. I want to live my life victoriously and I know that this is only possible when I follow YOU whole heartedly. Next month we will talk about how to be victorious when the storm is on the horizon! Comments for Headed for the ditch? As I have mentioned in the past I was diagnosed as having PTSD. I do fine during the day but at night I have night terrors. I don't understand. Sometimes it seems the struggles and turmoil in my life are raging inside and outside of me and it's hard to tell which is which. i can't even see the road. I used to feel i might be in the trunk of the car. however, I've come to the conclusion that no matter where I am, I now have a steady spot to center on as i spin so that i don't get dizzy or lose my balance: spotting. I have no idea the road, the vehicle, the driver, or weather conditions or even passengers. But I know the shortest path between two points is a straight line. God is here, there and all along the way. That's all I know. I have been struggling with my faith for years. I had a bad string of boyfriends and roommates that really challenged my desire to stay on God's path for me. Im married now, with 3 kids of my own and 3 step-kids; and I have the opportunity to stay at home. This is givng me a wonderful chance to find myself again, and God! Keeping focused on God will get me through anything, this study really helps focus on that. I look forward to learning more from this site. Tonight I felt very Sad and last night I felt on the verge of despair . I picked up the bible but did not know where to start reading to receive something that could alleviate my turmoil. Tonight I again reached for the Bible and said where do I start. Then it occurred to me to seek an online study group. Something in your personal statement caught my attention and the lesson was about Jesus, Peter and faith. It touched me because I too am crying inside and I feel like I am drowning. I know I am like Peter the "winds" are distracting me so much I can hardly see in front of me. However I am pleading for God to extend his mercy towards me and rescue me. Thanks just what I needed to read tonight. Love, Love, Love this lesson!! I so needed this study! I remember living this victorious life! Just recently I have been given an opportunity to help a sister in Christ learn these concepts. It has reminded me that I can also be victorious in Christ! I am so excited and refueled for the journey ahead. I had lost my focus and the opportunity and this study have stirred my spirit, I feel so ALIVE!!! I am so blessed to have Jesus in my heart and God the Father on my side and the Holy Ghost as my guide in life! I can and will live VICTORIOUS in Christ! Thank you so much for sharing! The scariest part of that story, to me, is being the only one trying this crazy walking on water thing. I am normally trying crazy things, directed by God, or just because I feel like it. But somehow, when I find myself hearing Him, my first instinct is to wonder if anybody else wants to go with me. P.S. I didn't see a date on this, and am new to the forum, so I hope this isn't old news. Thanks Bruce and I totally agree! Bruce, you are right! In the middle of a storm, we DO often think "My goodness Lord, this is bad enough already! You want me to do WHAT?!?!" One other twist to the story that we could talk about is the fact that Peter ASKED Jesus "If it is You Lord, tell me to come to you on the water". Jesus did as Peter asked. THEN Peter got scared when he realized the reality of what he had asked for. I wonder, did Peter expect that Jesus would still the waves once He called him onto the water? Did Peter think (as I have) that his WILLINGNESS to leave the boat was enough and that he would not actually be required to feel the wrath of the storm? I don't disagree with anything you've said about the need to keep our focus on Jesus. But one of the things that has always struck me about this text is that, in the middle of the storm, Jesus tells Peter to get out of the boat. As bad as the storm was, common sense would still dictate that the safest place to be was in the boat. I think that's how many of us are. We're in the boat, and the boat's in trouble, and we call out to Jesus, and he answers, "Get out of the boat." Hold on a minute, Lord. You want me to do what? I reminded of the kids in the Chronicles of Narnia, who ask Mr. Beaver if Aslan is safe. "He's a lion. Of course he's not safe. But he's good." Jesus isn't always safe, but He's good. And sometimes, despite our human inclinations, the smartest thing we can do is get out of the boat, even in the middle of the storm. Wonderful comments and inspiration to all of us women, whether young or old. We need to be reminded to keep our eyes focused on the One who plans our every step and let Him guide us. I enjoyed your first lesson. Well thought out and very relevant to all of us who tend to loose our focus and forget which way we should be headed. Don't know how you find the time, but I a happy that you have. Thanks for sharing your heart Kris. It is hard for me to admit that I don;t seek God's face inthe middle of troubles and trails. I am easily intimidated by the giants in my life. I often find myself drowming in the waves of a storm. I appreciate your reminder that GOd HAS provided everything I need to fight any battle!